Passed away November 4, 2018, (suddenly), at home, dear husband of Isobel and loving father of Gary and grandfather of Emma. His Funeral will take place on Friday 9th November 2018, at Roselawn Crematorium at 1.00 p.m. 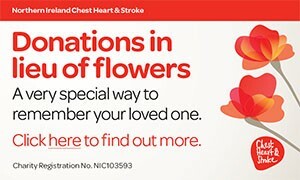 Donations in lieu, of flowers, if desired to the Alzheimer's Society, c/o Melville Morgan Funeral Directors, 195 York Road, Belfast, BT15 3HB. Deepest sympathy to his wife Isobel, son Gary and granddaughter Emma, from brother-in-law Robert and Tina. Deeply regretted by his sister Maud and family, Gloria, Ivan and daughter-in-law Sandy. I am sorry to tell you that JOSEPH CAIRNS has passed away.